It's time for Universal Studios. This is our second visit to Universal Studios. Last year Louis was still a baby, so he could not join me in some of the rides. This year, Louis would be able to experience some rides with me. There are many fantastic reviews on USS out there in the web. We would try to focus on what is important to us kids! We would try to highlight what are the rides for kids our age and what to expect. Daddy's Tip : Do get your tickets before the actual day. That way you do not need to waste time queuing up for tickets! Go early too as the Sun can get real hot in Singapore! There are no major characters that are associate with Universal (unlike Disney), the more popular ones originated from Movies and not comics. They include Shrek, Transformers and Kung Fu Panda. USS manage to get Sesame Street in their line up as well. We would be reviewing their performance soon! For families with young kids like us, we suggest you turn left after Hollywood to Madagascar. King Julien's Beach Party Go -Round. Do note that there are certain height restrictions for the rides. Little Lou managed to make the cut to the ride. However do note that it is pretty dark during the ride. Louis had sat on a river ride before at Disneyland HK. However during this ride, he got a little scared off by the 'animals' . This ride is touted as Universal answer to Small Small World (SSW), however we think it has a long way to improve before it can reach the cult status of SSW. 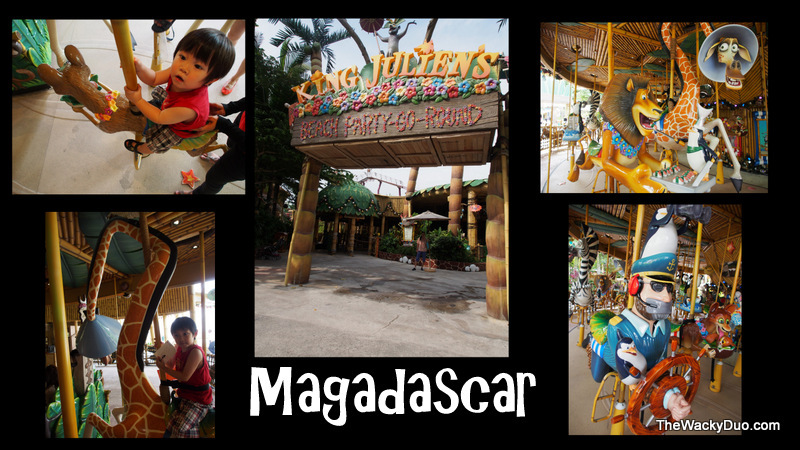 Our next stop is King Julein's beach Party-Go-Round. Little Lou's tears quickly turn to smiles after riding on this. I think he likes Merry Go Round like me! Our next world is Far Far Away. This is another world catering to kids. Of the 4 , we only tried Magic Potion Spin. Daddy's Tip : When going to theme parks with kids, the best plan is not to plan so much. It really depends on the kids mood, so the best course of action will be reaction to their mood. That way everyone will enjoy the park. Do not attempt to force them to take a ride or watch a show. In addition, it is always better to complete the rides when their energy is high and leave the shows for a later time. Otherwise they might get cranky and decide to go home! Our next world is The Lost World. By this time, rides are more focus on the bigger boys. I decided to try the Rapid Adventures as I had tried something similar before in South Korea Everland. Be prepared to get very wet for the ride! There was a steep decline at the end of the ride, that caught me off guard and ruin my mood for the rest of the rides. I decided I had enough of rides. Daddy's Tip : Always have a Plan B. In our case, it is Watch the shows! but unfortunately neither of us can ride it. Transformers the Ride (min height 102 cm). Daddy's Tip : Bring strollers especially with kids that needs to be carried. They double up as beds when they are tired (Strollers can be rented at USS). In addition, bring your helper if you can. It's a break and reward for them. 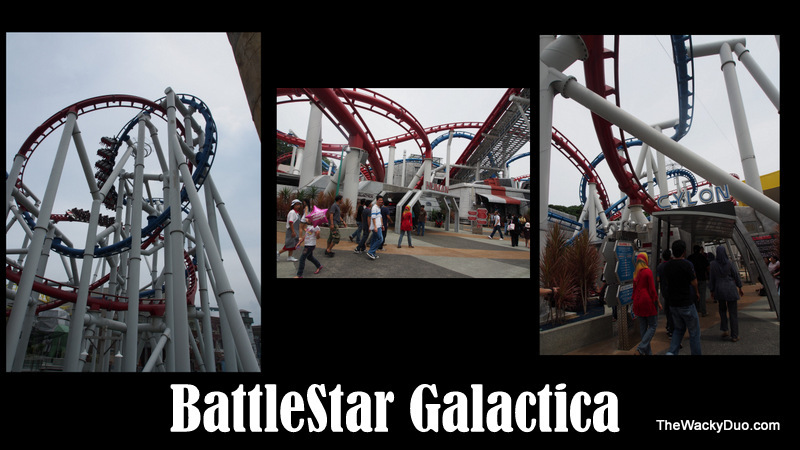 We did sneak off and took the Battlestar Galactica as Cylon. It was the most exhilarating ride we had taken in a long while! Luckily the wait was not very long for this ride. In addition, we managed to use our express pass that came with the package to get straight into Transformers the Ride. This is the newest ride in USS. We were completely Wow by the ride. This is the best 3-D ride we took in terms of graphics and motion. A must try in USS! 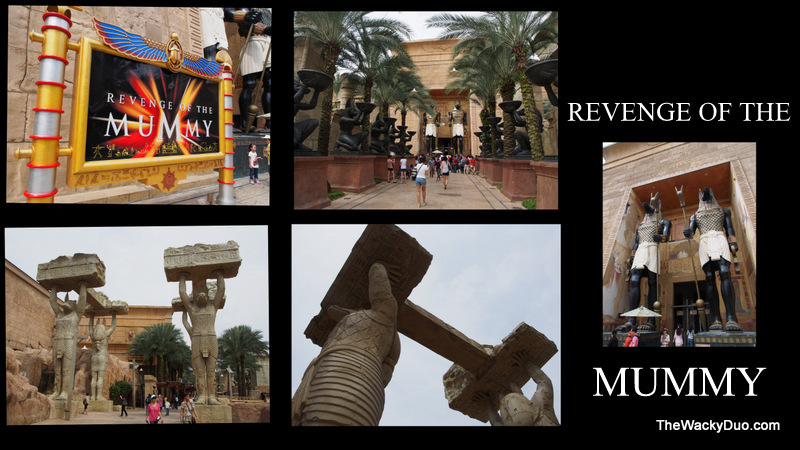 With Battlestar and Transformer, we think these 2 rides will define what USS means to adults. So do not miss it! There are also child swap programs for parents with young kids for certain rides. This allows a parent to wait in the line while the other looks after the child/children. Once the former completed the attraction, he/she can swap with the partners and the other parent can immediately enjoy the ride without queueing. We finally reach New York. 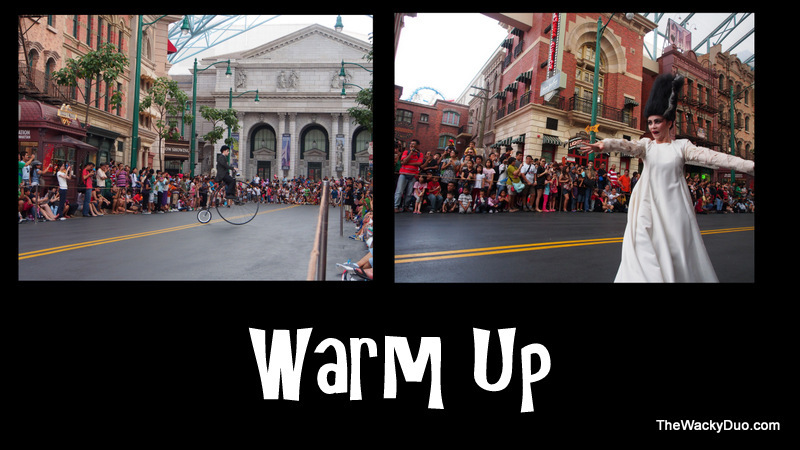 Our parents had prep us for this segment before coming to USS. Our main aim for today's visit is the Sesame Street show in USS. Check out our special review for the Sesame Street Show! We managed to watch Rockafellas dancing on the streets of New York. Unfortunately we were too tired to try it. Louis wants to be a B-boy! 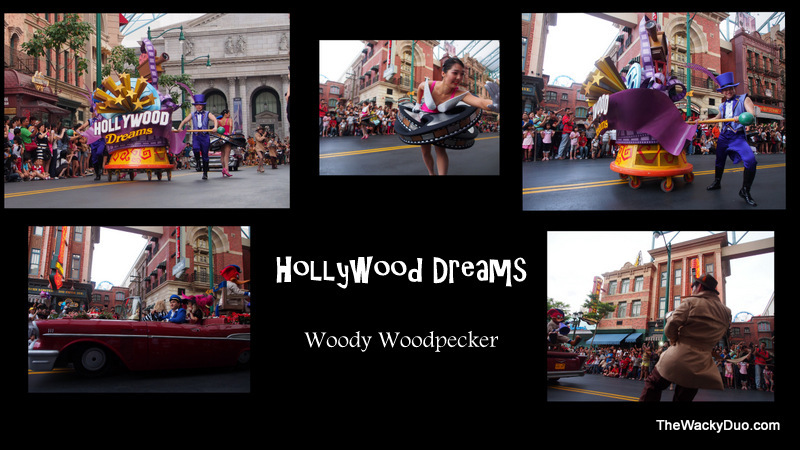 We went back to the hotel for a short break (milk time) before coming back for the Hollywood Dreams Parade. The parade was supposed to start at 6pm, but we only caught it at 61pm. We sat along the street at New York. We should have gone nearer to the City hall for a better view. 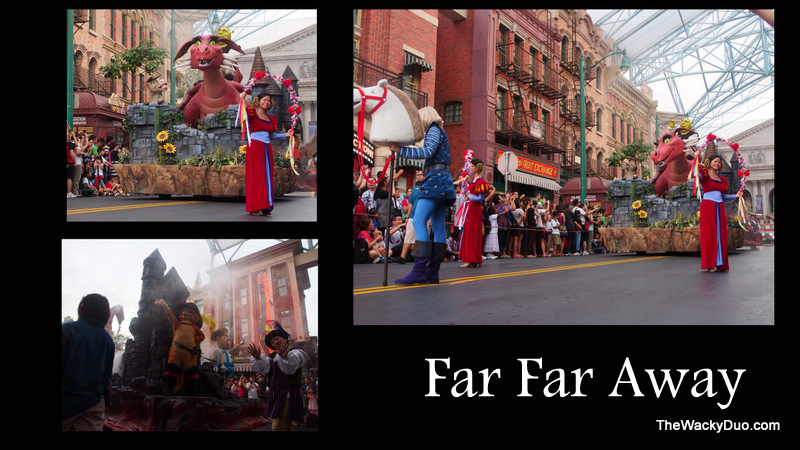 The Parade was interesting due to the new characters we saw. 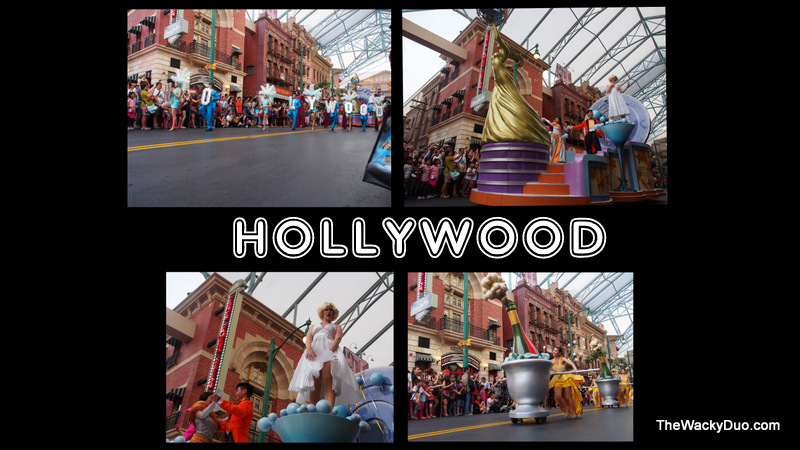 However compared to Disney parade, there are room for improvement in terms of choreography, sound system and theme. Daddy's Tip : Try to go on Sat /Sun for the parade. If you like fireworks, you should go on Saturday instead (Check their schedule for availability under Hollywood after hours (HAH). Do note that there are no night entrance during school holidays. Otherwise, you can catch the fireworks on Sat by purchasing a $5 entrance fee during non school holidays. We were bought Far Far Away with Shrek and his band of merry misfits. We hope Universal Studios can add Transformers and Sesame Street to their Hollywood Dreams line-up. Together with better choreograph, it will make a fantastic show! We had spend almost the whole day at USS. Be Prepared to spend one full day in USS to complete all the rides and shows. It may be possible to do it all especially when the queues are short. 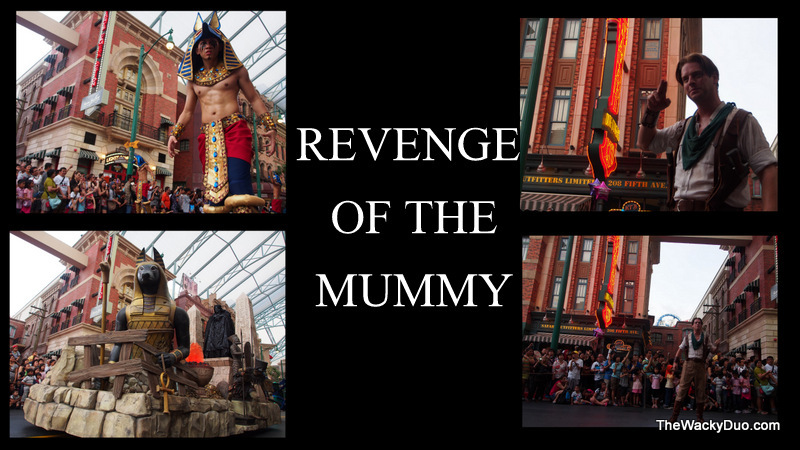 We hope you find this review helpful an enjoy your next visit to USS! Peak period differs, refer to website. 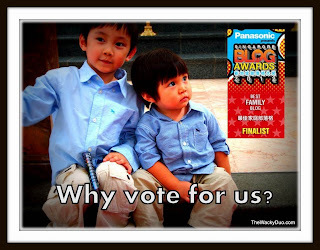 Singapore Blog Awards 2012 Finalist- Please vote for us! Nice write up, especially from a kid's point of view. 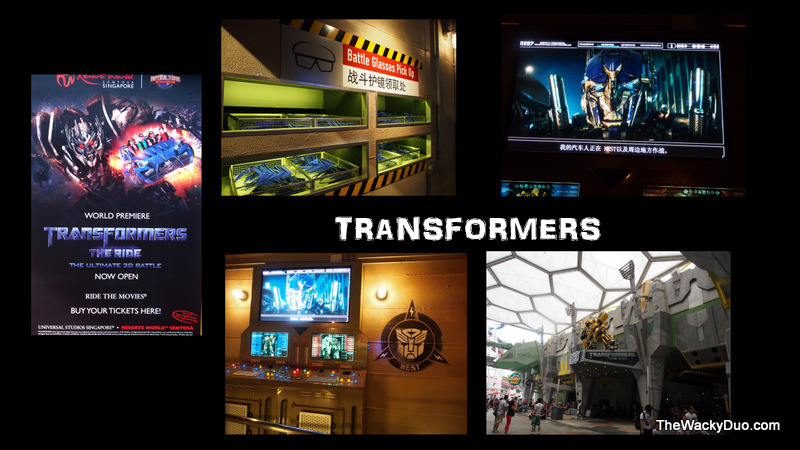 One point though - the robot in the photo labelled as Optimus Prime is actually Evac, the 'new' Transformers that you actually ride in TRANSFORMERS The Ride. Thanks rwsentosa. It means alot to us to get compliments from the host. Sily us, Optimus Prime keeps appearing on the ride that subconciously , we equate him with Evac. Had made the changes. Thanks! 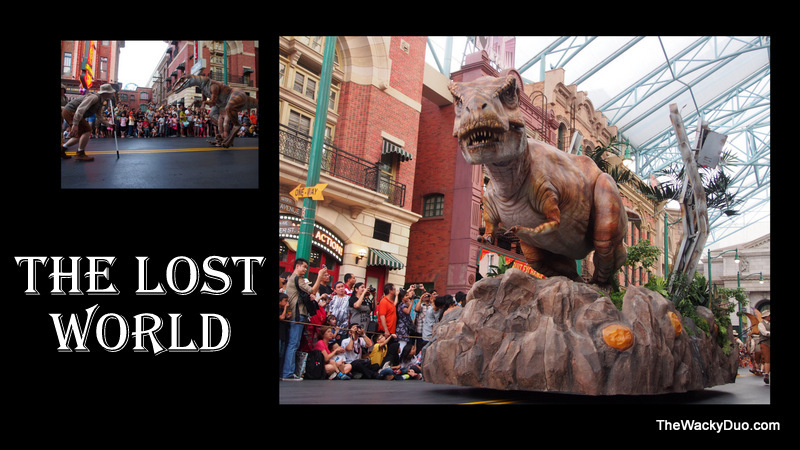 All of which are just a 10 minute walk from Universal Studios Singapore. Be sure to also visit the popular new tourist attractions S.E.A. Aquarium and Adventure Cove Waterpark. Hi, great photos! The "Countess Dracula" character you pointed out was actually the Bride of Frankenstein from the movie of the same name. Great thanks for sharing this. Nice write up, especially from a kid's point of view.